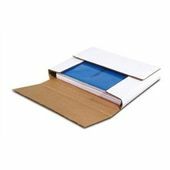 Sturdy packaging solution for shipping books, record albums (45s, 78s or LPs), pictures, framed art or other items. Place product in the center, fold in sides and seal. Each book fold is scored at various heights to create the perfect size package for your item. If you previously purchased any products in this category and would like to leave a review, please click on the picture of the product you purchased and scroll to the bottom of the page. All reviews would be greatly appreciated. Browse these categories under "Book Folds"
Featured products under "Book Folds"